Reduction of depression and stress. Supports cell reproduction and constant renewal of the skin. Helps to protect against many different cancers. Many groups of people are at risk from deficiency of B12 due to their lack of consuming foods such as dairy products and meat. 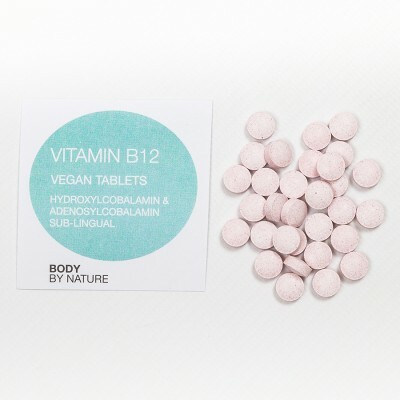 Vegans and the Elderly are particularly at risk so a supplement like Body By Natures Vitamin B12 can be beneficial Food State Vitamin B12 is in the form of methylcobalamin which is bio effective unlike most others which are cyanocobalamin – this needs to be enzymatically converted to methylcobalamin in the body). Vitamin B12, also known as cobalamin, is vital for supporting a healthy metabolism and central nervous system. It can be found in a variety of foods, including eggs, meat, shellfish, and fortified cereals. Vitamin B12 can be stored in your liver for years, unlike other vitamins in the B family. It’s primary role is to support the metabolism which is the amount of energy (calories) your body burns to maintain itself. Yeast; wheat; starch, gluten; soy; added sugars, colourings, flavourings & preservatives.